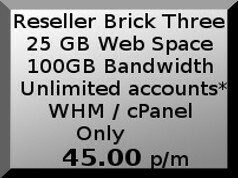 Reseller hosting is an inexpensive way to start a business or simply provide hosting to your clients. Reseller hosting makes offering hosting services to your clients easy since it doesn’t require you to manage the server hardware or operating system. With our installed cPanel & WHM software, you can purchase reseller hosting from iisnet-networks.com and then resell those hosting services to your own clients. Clients web sites hosted on SSD Drives for super fast access! Access your WHM control center from any computer and manage your clients websites. No limit to the number of accounts you can create providing you stay within your plans total disk and bandwidth.